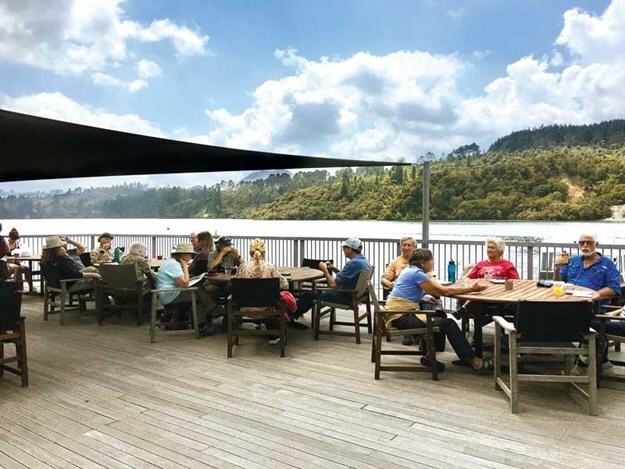 Occasionally, when I visit Taupo, I still feel a frisson of indignation as I drive past the corner of Pataka Road that leads down to the lake’s edge. Memories come in fragments dragging with them a jumble of feelings that can surface long after the event. On the family holidays of my childhood, we always stayed in an old bach in Pataka Road, which has long been replaced by luxurious housing. 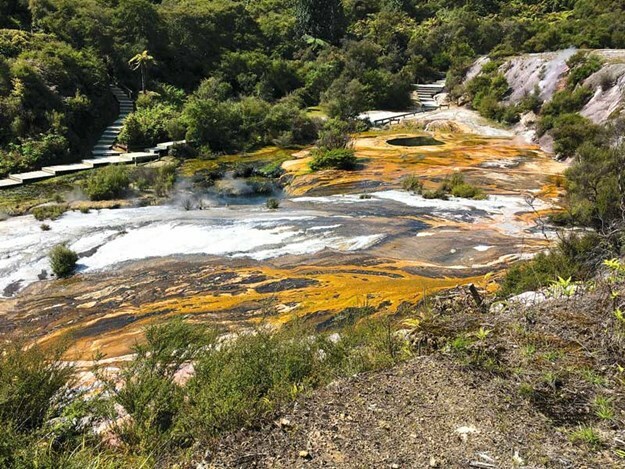 In between swimming, sunbathing, and wallowing in the hot pools, we’d be taken on expeditions and under that label, I think we went to almost every thermal park on the Central Plateau. To the small me, these treats were untiringly full of wonder. And here comes an event. I’d nabbed the communal packet of chocolate and hidden it under the pillow on my bunk intending to eat some of it under the cover of darkness. But the misdeed did not go unnoticed. I was sprung by my vile cousin and the ‘grown ups’ were informed. Publicly admonished by my mother and not knowing how to recover my mana, I poked out my tongue. This was a punishable crime; and so, while all the other kids went off on an excursion to Orakei Korako, I was left behind in the care of an ageing aunt. Although many decades have passed, I still felt slightly peevish about such harsh punishment. That is until last month when I decided the time had come to right the wrong. 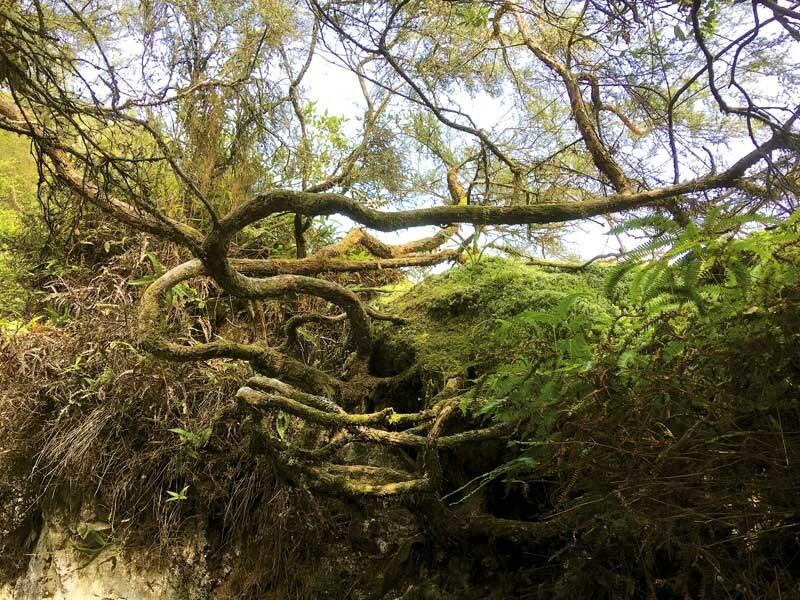 For me, the name Orakei Korako has a mystical lilt. Translated from Maori, it means ‘the place of adorning’. From the turn-off from SH5 between Taupo and Rotorua, the indicated road undulates through shapely farmland peppered with large trees. A high escarpment curved away to the north drawing the eye. I began to think we were heading into the middle of nowhere until we rounded a bend and stretching before us was the mirrored surface of Lake Ohakuri. A large carpark has been carved into its side and from there, a landscaped path leads to a modern cafe and visitor centre. The building sits unobtrusively on the lake’s edge and a shaded verandah affords views across the water to the bald surface of the thermal terraces. 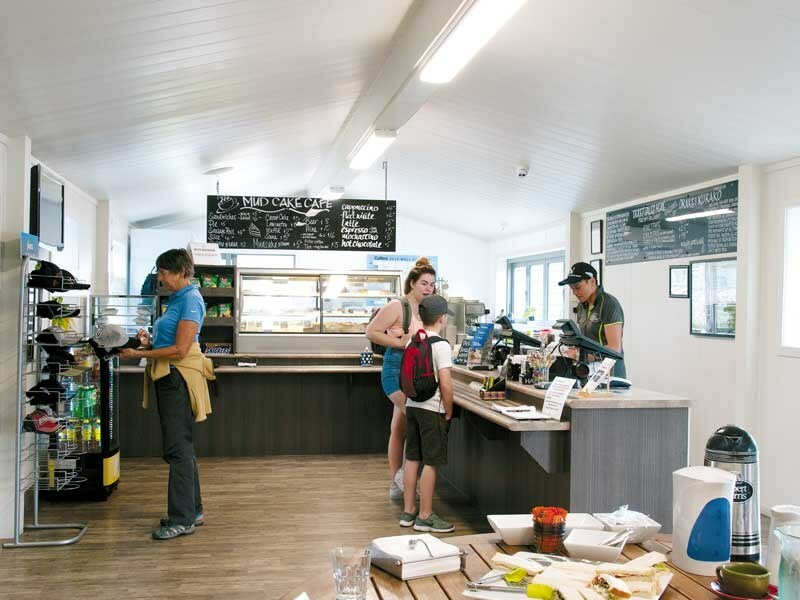 In the Mudcake Café, I met Demelza Gilbert, who with her partner, Nick Gibson, has been managing the centre for the last two years. She offered me coffee and told me about the park, but more about the coffee. "I’m fussy about the quality," she said. "It’s not the reason people are here but you don’t come all this way to have to have bad coffee." The food didn’t look too bad either. 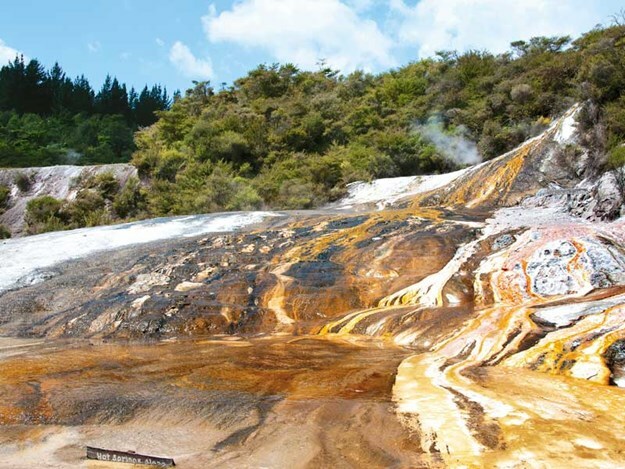 We could have taken some for a picnic among the fumaroles. Instead, we took a lot of water. It looked hot over there, and I was right. Nick skippered the little launch that took us across the lake, and, five minutes later, we disembarked in a different world. It was the noise that struck me first—the burping, gurgling, and gasping as if some subterranean monster were fighting to break through the surface. A notice informed me: "The valley is unchanged for hundreds of years so do not disturb a single thing". In fact, this is not entirely true. 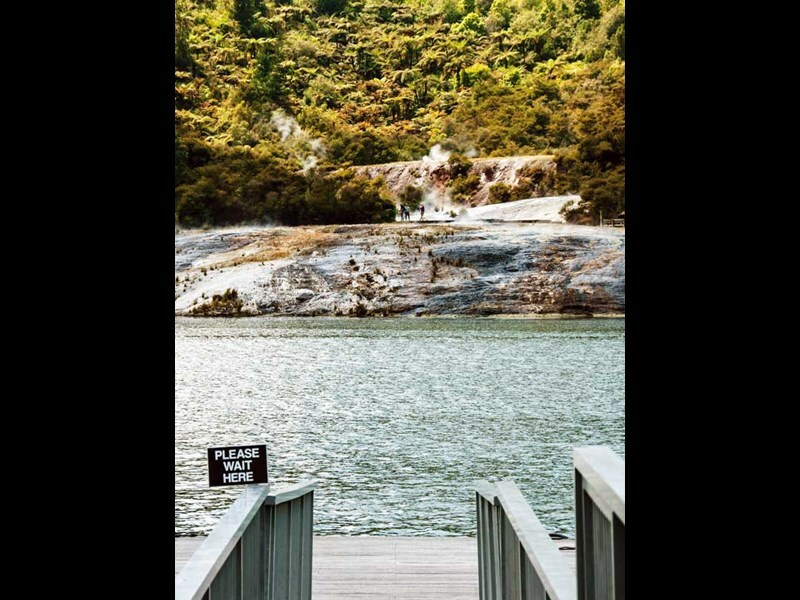 The Ohakuri (Cloak of the Dog) Dam across the Waikato River was finished in 1961 and gave rise to the lake we had just puttered across. 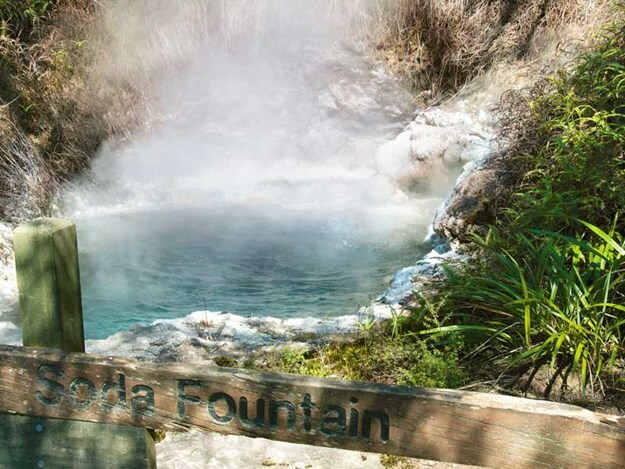 As a result of the damming, the water level rose 18 metres drowning 200 hot springs and 70 geysers, two of them the largest in the world. Rather than lament the loss, I thought it lucky there was anything left at all. 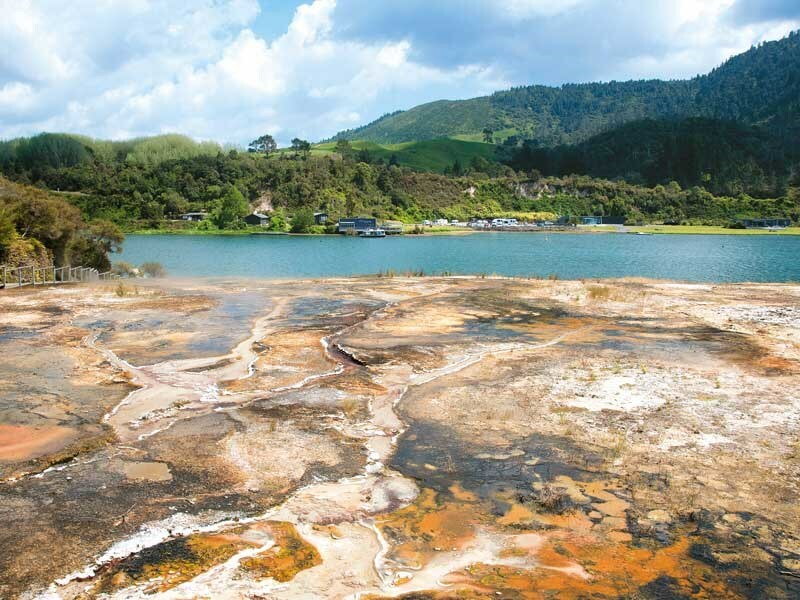 Orakei Korako is the largest thermal park in New Zealand and is still awe-inspiring. The field comprises four large sinter terraces. 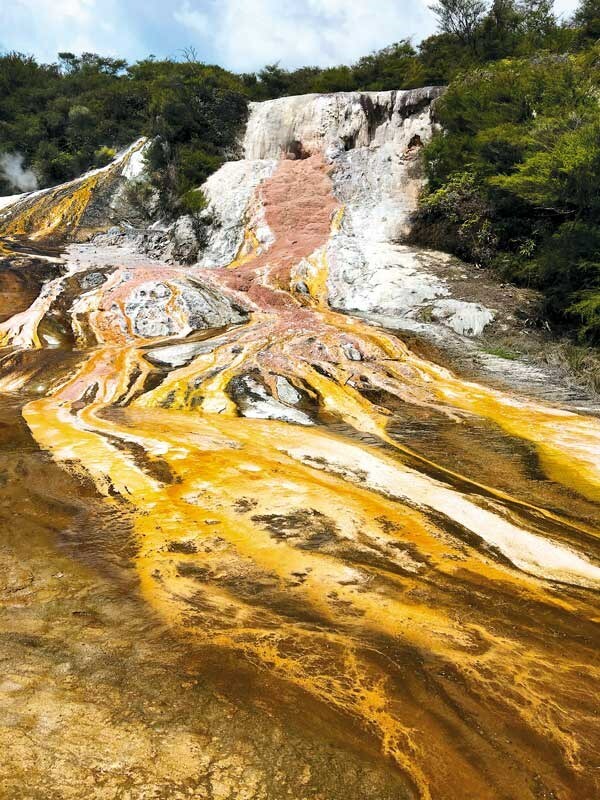 The lowest called Emerald Terrace was before us as soon as we landed—a bulging formation covered in a rainbow of multi-coloured, hot-water algae. 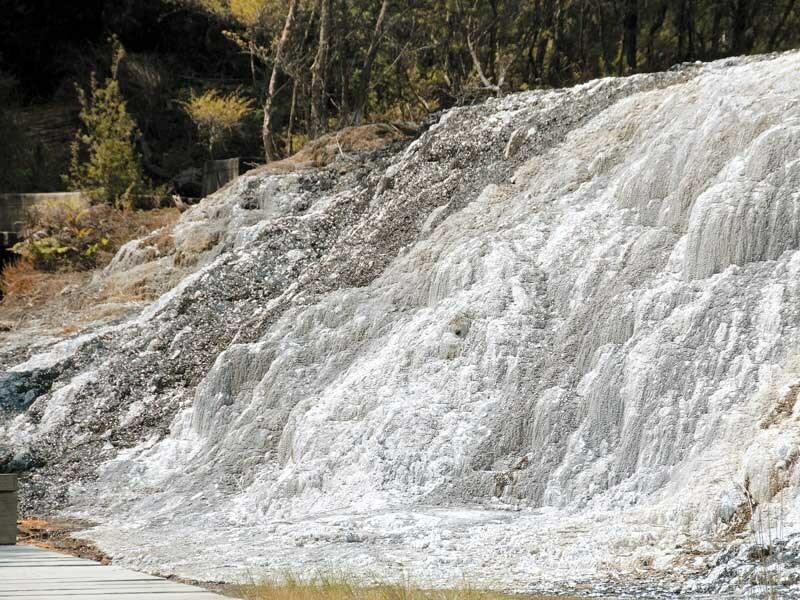 Up to 20 million litres of silica-bearing hot water trickles over its surface every day. Over to the right was an astonishing sight. From a cliff of white silica swept a petrified waterfall of pink, gold and ochre as vivid as spilled paint. And as I stood in admiration, a geyser began to hiss and gargle and expel a cascade of boiling water. It was our introduction to this animated landscape of colour, texture, and shape. 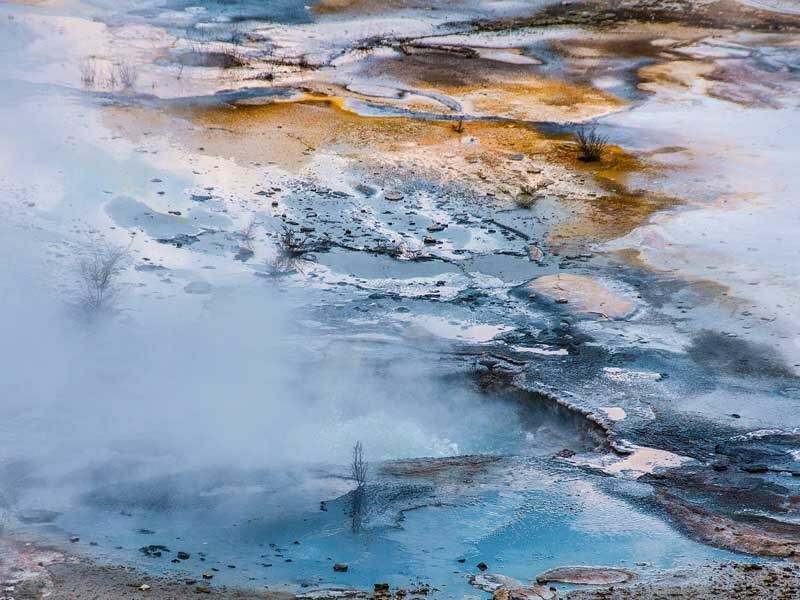 The higher terraces are divided by great scarps formed by earthquakes and dotted with geysers, steaming pools, boiling mud, coloured stalactites, deep crevasses, and encrusted fumaroles. The most impressive scarp is called the Golden Fleece. It’s five metres high and 40 metres in length. I’m not sure what ‘golden’ alludes to as the scarp is coated by beautiful white crystallised sinter. It was not so white the day we were there as recent rains had muddied the surface. We gazed in awe at all this during the 2.5km walk around the park that’s said to take two hours but took us three. Most of it was on sturdily constructed, boardwalks. Features and foliage were clearly signposted, which thankfully was the only guidance. It was delightful to wander without a guide. Guides so often irritate me. They tell me what to think and ruin my sense of discovery. Nor were there hordes of tourists. Most of the time we were almost alone. But at the entrance to the famous cave there’s a seat and on it perched a red-faced English couple who were sucking gratefully on their water bottles. We joined them and began to guzzle from our own. Tim and Frances had just about finished a three-month trip around New Zealand in a motorhome. "Of all the highlights this has got to be right up the top," said Frances, wiping her forehead with her sleeve. "Beautiful in a terrifying way. I keep thinking there’s going to be an earthquake and we’ll blow up. There’s so much power." When we’d cooled off a little, we climbed down to look at the cave and I became a bit guide-like myself. "You’ll be fine," I said. 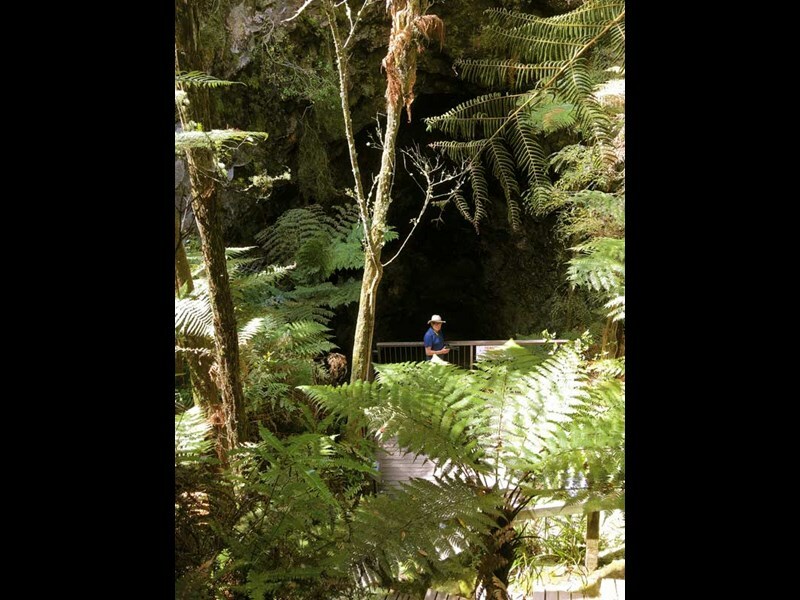 "You see the cave’s called Ruatapu, which in Maori means ‘twice blessed’. 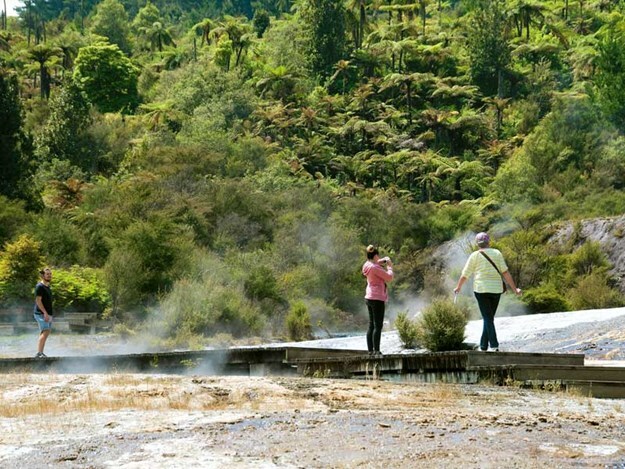 Maori women used to come here to receive blessings for the important events in their lives. Men were apparently not allowed. They are now. The tapu was lifted in the early 1900s." We peered downs at the clear water of the pool that filled the floor of the cave and wished we could swim there. It looked cool but apparently, it’s warm and acid. 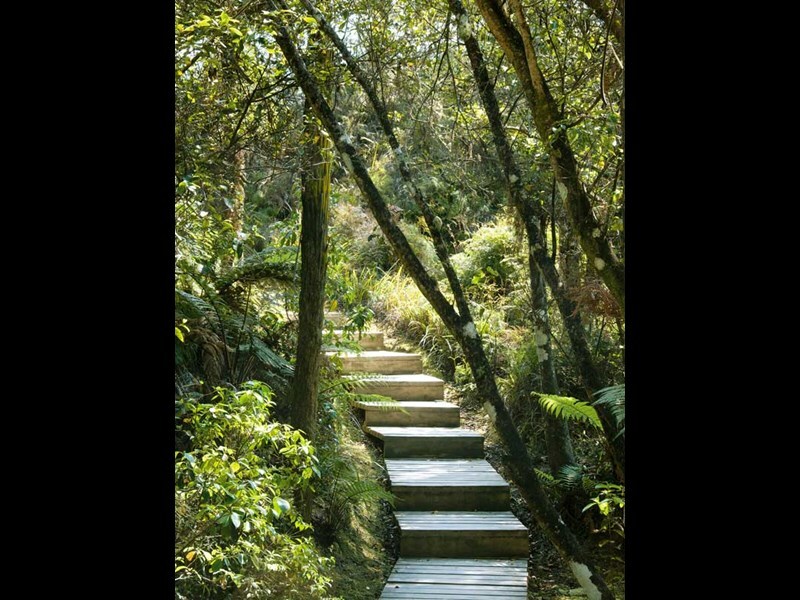 Past the mud pools, the track led into the shade of a pretty forest of ponga and kanuka. 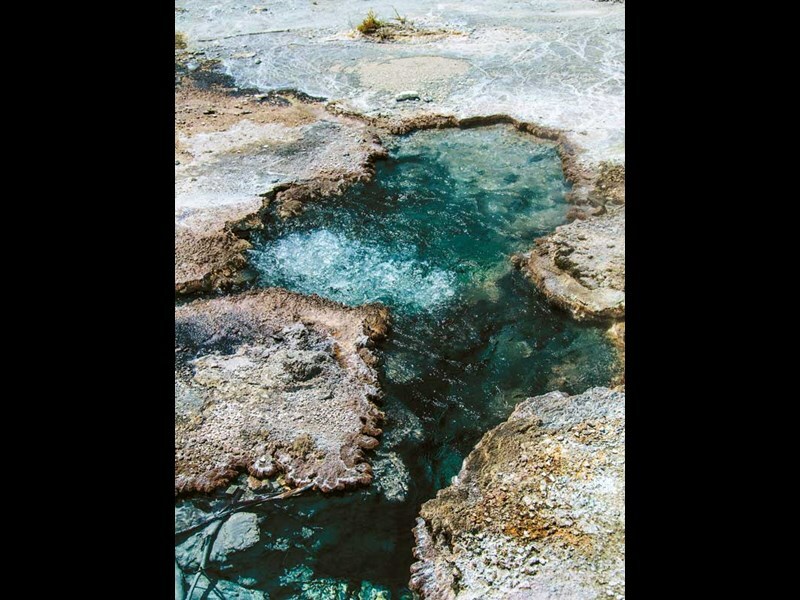 After the heat of the thermal field, it was like walking through a cold shower. Back on board the ferry, I looked back at the bizarre landscape. Slanting sunbeams lit the drifts of steam that hung over Emerald Terrace and looked like a gathering of ghosts. My own ghost had been laid. I’d finally made it to the place I’d missed out on all those years ago. To celebrate I’m going to buy a packet of chocolate and one night, I’ll eat it, on my own, in the dark, in my bed. 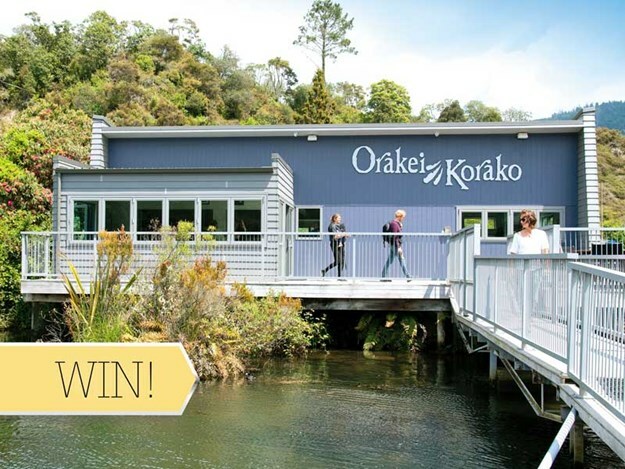 We have two double passes to Orakei Korako to give away. Competition ends 11 January 2019.